Spoiler alert: This book features a fire in a teahouse. Surprisingly, it occurs at a climactic moment—so it really is a kind of spoiler—but it doesn’t take away from the impact of the event. I picked up this book secondhand during the Garage Sale Trail. It took me a while to decide to buy it. Obviously price wasn’t an issue; I was simply wary of the ‘white author writing about Japan’ situation. Arthur Golden’s Memoirs of a Geisha*, though drawn from interviews with geishas, had an icky veneer of oriental fetishisation throughout that has made me cautious about investing in a similarly positioned book. Firstly, I’d like to congratulate Ellis Avery on treading a fine line with such care. Unlike Golden’s fictionalised memoir, written in the first person from the viewpoint of a geisha, Avery chooses a French (via New York) girl as her narrator. Aurelia, by circumstance, finds herself in Japan and then by will decides to leave her cloistered life (literally—she is brought over by a missionary uncle) and accidentally ends up in a teahouse. Positioning the protagonist as an outsider close to the action allows the narrative to unfold in a way that introduces a non-Japanese readership to both the period (mid-to-late 19th century) and the country without disorientation but also makes room for non-judgemental western observations and comparisons without falling into fetishisation. The second thing I’d like to note is that tea is not incidental to this book, hence my inclusion of it on this blog. The titular teahouse is not a backdrop, it is central to the plot and the chado (Japanese tea ceremony) performed by the main characters come to play a large role in the action, representing both the social and political situation. Even if you know about chado, there is plenty of rich (fictionalised but probable) detail here to add to your knowledge base. Avery cleverly pivots chado’s masculine samurai roots on the west’s increasing influence on Japan in the latter 19th century. It then becomes a more feminine practice, first by geisha and then as a sort of cultural touchstone for schoolgirls to learn so they can serve Japan by serving their future husbands. Another important note: Avery never gives a step-by-step guide on chado. This is not that kind of book. Instead, the reader is satisfied knowing that Avery knows chado but is content not to use the novel as a ‘look how much I know’ brain dump and that makes all the difference. When I like a book, I usually read it very fast, within a day or two. The Teahouse Fire resists that kind of gluttony. I found it incredibly absorbing, moving at a pace that was steady but not plodding, that compelled me to take my time, echoing the meticulous movements in a tea ceremony. The novel is slow; it spends a long time explaining the events of 1866, for example, but deliberately so and in a mesmeric way. If you cannot read like this, this is not the book for you. If anything’s wrong with the pacing, it’s in the epilogue, a nice little ‘what happened next’ but too rushed in its exposition. I also didn’t find the Aurelia/Inko love story all that compelling; while it’s terrific to see queer characters (especially in novels that are not primarily about queerness), the strength of this novel is the unrequited love between Aurelia and her mistress, Yukako, and the parallel with Sei Shonagon (11th century author of The Pillow Book) and the Empress she serves. Aurelia’s realisation that devotion is not love and Yukako will never love her in the way she wants is a powerful moment. Essentially though, this novel is about otherness. Aurelia is an outsider from the beginning and remains an outsider no matter how integrated she seems. But it is also about the way access to tea is structured: at the beginning men can learn chado and women are outsiders (Yukako is literally outside the tearoom watching her father teach and serve in order to learn), and there are also incidents where careful invitations to tea make certain other people outsiders. Add to that the macro picture of westerners being kept outside of the tea world until Japan hosted the Expo (World’s Fair) twice in the 1870s and Aurelia’s otherness is amplified. Verdict: As historical fiction this feels complete. We are offered Aurelia’s account of her time in Japan and while her story leverages real figures from the tea world in a believable fashion, we expect no more on them than we are given. The importance of these figures, and the context in which they lived and practised chado, is shown not told, and that makes this novel a wonderful starting point for other kinds of reading you might want to do around Japanese tea. Recommended if you can handle the literary style and pacing. 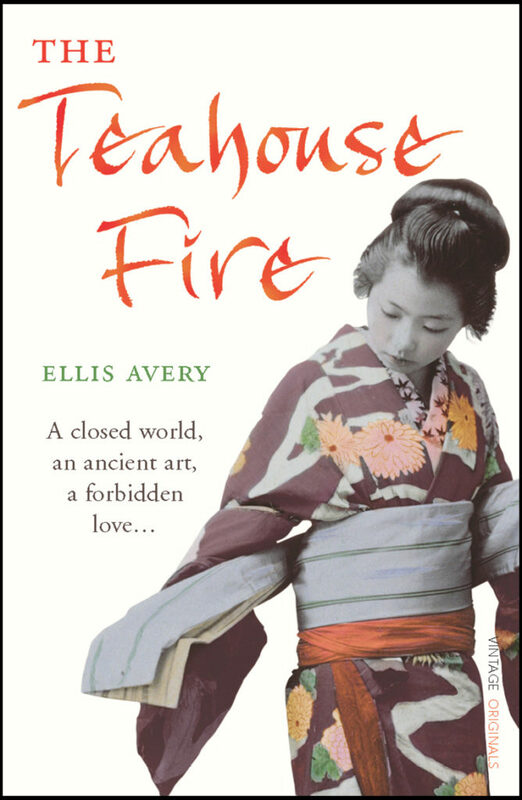 The Teahouse Fire by Ellis Avery (Vintage Random House, 2008) is available from various sources online. *I’d also like to apologise to Avery for comparing her novel to Golden’s. This is a far more carefully researched and written book, definitely more culturally sensitive and narratively less glamorised. This entry was posted in books and tagged book, matcha, review. Bookmark the permalink.